As you can read on the Service Provider Connections page, you need to install and configure one or more service provider connections for SMS messaging using Ozeki NG - SMS Gateway. One of the service provider connections supported by the software is the CIMD2 connection. The Computer Interface Message Distribution (CIMD) protocol was introduced by Nokia. The Nokia SMS Center includes an CIMD2 interface that transfers messages between applications and the Nokia Short Message Service Center (SMSC). CIMD2 is version 2 of the Computer Interface to Message Distribution protocol. The CIMD2 interface is suitable for client applications that send and retrieve messages over TCP/IP sockets, such as Ozeki NG - SMS Gateway. One of the advantages of using CIMD2 connections is that you can specify the sender address of the message. The sender address can be a custom phone number or a short word containing alphanumeric characters. (See the instructions about the overridable checkbox below.) Note, however, that some GSM service providers restrict the use of this option. Another advantage of CIMD2 is that it allows sending messages of every type the GSM network can carry. It can be used to send binary SMS messages (operator logos, ringtones), WAP Push messages, as well as other types of messages. (Check out the Appendix for links to pages about different message types.) Concatenated SMS messages and various alphabets can also be used. A CIMD2 connection can be used through an IP link. This link can be a leased line or the Internet. Optionally the link can be protected by VPN. To select the CIMD2 protocol, click the Install link in the respective entry in the list (Figure 1). When you have installed the CIMD2 Connection, the Configuration panel will show up on the right of the interface. The first tab of the panel is the CIMD2 settings tab, which consists of a Connection and an Identification section. First, specify the CIMD2 server settings. This information is provided by the GSM service provider whose service you have subscribed to. The connection parameters are the host name (or IP address), the port number, a username and a password. The hostname refers to the server that Ozeki NG - SMS Gateway will connect to. This specification allows you to customize a connection. The valid values of the port parameter range from 0 to 65535. The username and the password are text attributes which can also include numerical characters. Service providers often use the phone number of the service or the port number as the username. These specifications are an essential part of the SMSC authentication method. Enter the information in the respective edit boxes (Figure 2). In the Use source port edit box you can specify the source port. Only use a value other than 0 if your operator prompts you to do so. 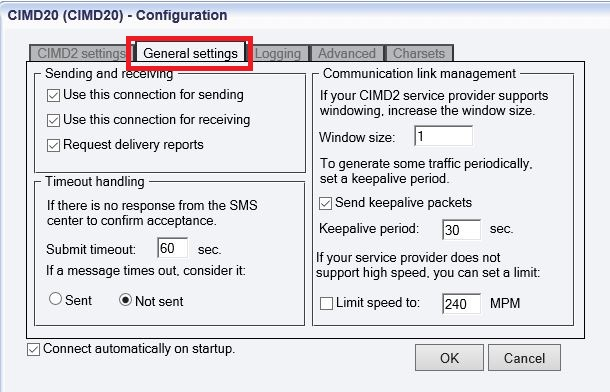 To perform general settings related to sending and receiving SMS messages using this protocol, click the General Settings tab. This will open a panel consisting of the Sending and receiving the Timeout handling and Communication link management section. In the first section of the panel you can check any or all of the checkboxes. Which one(s) to check depends on what you wish to use this connection for and whether you need a delivery report. You can choose to use the connection for only sending or only receiving SMS messages (or both sending and receiving), and you can choose to request a delivery report for outgoing messages (Figure 3). In the Timeout handling section of the tab you can make choices and specifications to handle your connection to the SMS Center and the status of your SMS messages. In the right section of this configuration panel you can manage communication links. At first, in "Windows size" line you can increase the window size, if your SMPP service provider supports windowing. The windowing feature of Ozeki NG - SMS Gateway enables the program to initiate more than one operation before receiving responses. For stop-and-wait flow control, use window size 1. (The maximum window size is 128.) You can set how many protocol messages can be sent out before the SMS Center responds to them. Protocol messages can include SMS messages, keepalive packets, etc. The default value is 1. If you set this number too high, your SMS messages may be discarded, as most GSM service providers try to prevent their networks from being overloaded (Figure 5). First, you can choose whether to make the program write log entries about sent and received messages in human readable format and/or log low level communication and/or log in hexadecimal format. Choosing the second option will make the program produce logfiles containing binary codes representing the communication data. In the Number of rotated files text box, specify the maximum number of rotated logfiles that are saved. Specify this number by entering a positive whole number. By default, the number of logfiles that are saved is 4 (see Figure 4 above). If you are content with the default specifications, leave the text boxes unchanged. The Advanced tab contains three checkboxes. 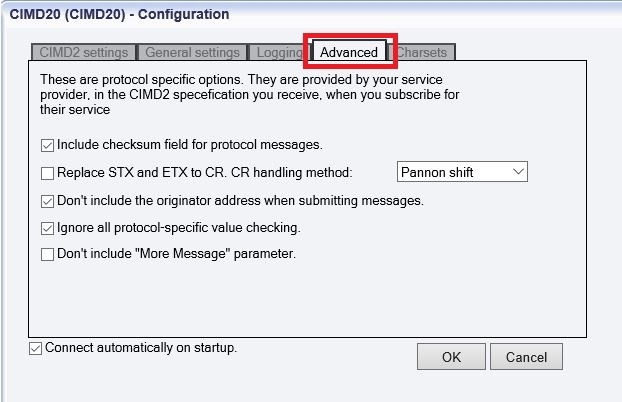 The Include checksum field for protocol messages checkbox allows you to make the program use a checksum to check the integrity of an SMS message. By default, this checkbox is checked. Check the Replace STX and ETX to operate with custom protocol implementations checkbox to avoid using the STX character, and to replace the ETX with the CR/LF (newline) character. Check the Don't include the originator address when submitting messages checkbox. Check the Replace STX and ETX to CR. CR handling method checkbox.